This is not the best time of year to come to the capital of China. Temperatures are around 32-35C, smog can be a problem and it is the school holidays. But needs must, we have some clear sunny days and the crowds are not too horrendous. 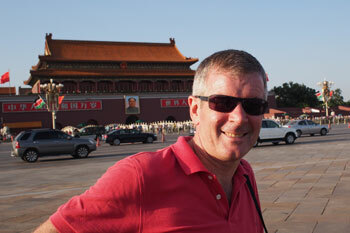 First trip after arriving on Sunday is Tiananmen Square. The taxi struggles to find somewhere to drop us as police hover in every side street but eventually we find somewhere to get out and walk around this huge space. Tourists are waiting patiently to see the flag being struck (not for another hour) or photographing each other in front of the heroic statues or the huge picture of Mao on the Gate of Heavenly Peace. 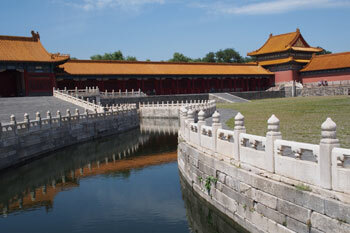 Next stop is the Forbidden City. We decide to go at 9 to miss the crowds (ha ha) and arrive at the gate to find a great mass of largely Chinese tourists, young and old, streaming over the bridge and through the gates to the entrance. Fortunately the space inside is so huge that it can accomodate us all and the efficient ticket booths quickly process everyone. After walking around the three great halls in the centre of the complex (all closed so no view of the dragon throne) I drag the other around the clock exhibition and then we pay another 10 RMB to visit the delightful Palace of Peace and Longevity; this is a mini forbidden city in its own right and once housed the empress and courtesans. It now includes the Treasures Gallery as well as the Opera House. Back in the main city we inspect the very crowded Imperial Gardens and some of the Western Pavilions before escaping for noodles and beer. We spend the afternoon in the delightful Beihai Park. The two 'must sees' in my guidebook are the Forbidden City and the Great Wall so off we head the next day with our tour guide and driver in a smart, Chinese made, Buick people carrier. After about 45 minutes we turn off the motorway and drive through attractive fruit farms before we start climbing into the hills. The landscape reminds me of Tuscany with farms, rows of tall trees, roadside restaurants and many stalls selling peaches, plums and other seasonal fruit. We decided to visit the wall at Mutianyu, a beautifully restored section that winds along the steep, wooded, limestone ridges. 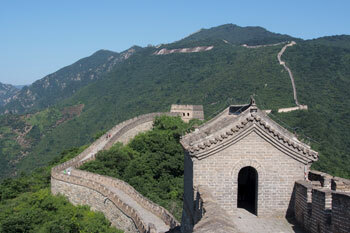 It is less crowded than Badaling, where the tour buses go, but still accessible. A bubble lift takes us up to the ridge so that we can save our strength for the steep climbing to come. My little group gradually falls away and I climb the last 800 steps of a steep section on my own before heading back for lunch. The trip is too short to visit many of the other sights of Beijing but we do see some night markets and enjoy some great Beijing food. From very stylish city restaurants to a fine lunch in the country near the wall I enjoy Peking Duck from its origin as well as learning the difference between Shanghai, Guangzhou and Beijing dumplings. 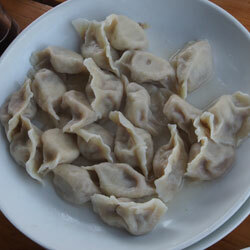 The Beijing variety are boiled, not steamed and the dough is thicker, but if they are well made like the ones we had in the country they can be delicious. Click on the images below to see a slideshow of my time in Beijing.